If you have a love of yachting, and a desire to belong to a community of people who feel the same, then HCYC is the club for you. We have many events throughout the year including club cruises, regattas, educational seminars, barbecues and the like. It's a great place to come together with your fellow sailors and boaters. 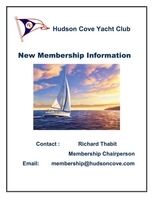 For detailed information about the benefits of HCYC membership, please download our Membership Brochure..
For a quick overview, connect on this website to About Us. It's easy to join. Just print out the application, fill it out and mail it in with your initiation and dues fee. Need a club member to sponsor you? No problem! Just leave the sponsor line blank and our membership chairperson will find the appropriate sponsor. Click on this link to open the HCYC Membership Application form. It's an Adobe PDF form. If you don't have Adobe reader on your computer, click the box below for a free download. Any questions? Contact Richard Thabit, our Membership Chairperson.. He'll be happy to respond to your email request and give any information. That's all there is to it. Hope to see you at an upcoming event!! !